On Wednesday, the Border Agency in Canada disclosed that it would increase the number of undocumented immigrants deported yearly by 10,000. Apart from the unaccepted refugees and asylum-applicants, the Agency will also deport those people that are considered a threat to the nation. Barre Campbell, a spokesperson from the Border Agency, told the state managed Broadcasting Cooperation of Canada that though the country is willing to welcome immigrants and refugees, everyone coming in have to abide by the laws of the country. In a backlog, there are over 18,000 immigrants that have been listed for deportation, and about 5,300 of them do not have a legal appeal or any valid reason that can allow them to remain in the country. The opposition conservatives refer to the number of people seeking admission into the asylum and getting in through the border of US a crisis. In their opinion, the Government is not perturbed by the issue and doesn’t have a plan of action. Liberals view the issue as a challenge. 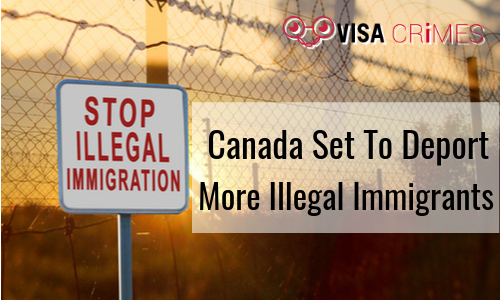 The spokesperson said that for the Canadian Border Agency to meet its target of deportation fast enough with respect to The Immigration and Refugee Protection Act, the Agency concentrates on raising the number of people to be deported for this year and the years to come. On Wednesday, PM Justin Trudeau said that the government is looking for ways to improve its immigration system and foster growth. He also said that it was very important for them to builda thriving immigration system, and they wouldn’t stop trying to achieve that. A great number of people who wish to become refugees or who are trying to get into asylums in Canada are from Turkey, Haiti, Nicaragua, Colombia or Eritrea.